Such a sweet card Sylvie..just love your colours. Great card love the image. Enjoy your trip! Keep warm. 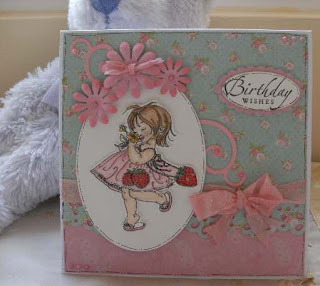 An absolutey gorgeous card, I like everything about it. Hi Sylvie. This is very beautiful. Love the pretty image and papers. Amazing colouring. gorgeous card sylvie.i love the adorable image and your colours and details are so pretty. Your card is sooo cute. Love the image. Thanks for joining us at PfP. This stamp is one of my favourite image and i love your card! Really cute! !